There’s much more to Bavaria than just the capital. Here’s a snapshot of what awaits in the next 10 biggest cities, in order of population. They’re all beautiful places to visit and very, very old. Each of these Bavarian cities has an impressive castle, palace, city hall and sometimes all of the above. I’ve included each city’s coat-of-arms because they give you a little clue about the history of the city, and hey, they're pretty. Check out the Bavaria map here. It shows the locations of these cities in Bavaria. CASTLE ROCK: Inside the Kaiserburg at Nuremberg. The castle was built in phases over 400 years from the 12th century onwards. 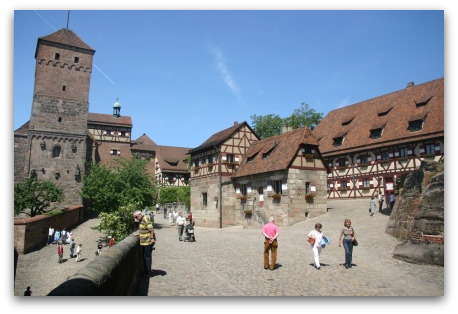 German kings liked to make their digs in Nuremberg, once the unofficial capital of the Holy Roman Empire. Nuremberg’s Hauptplatz comes alive with Germany’s most famous Christmas market (Christkindlesmarkt) in December. On a visit you can explore the medieval Altstadt (Old Town), framed by city walls and the glorious Kaiserburg (Imperial Castle). Then pay a visit to the Reichsparteigelände, a massive open area where the infamous Nazi Nuremberg Rallies of the 1930s were held. And don't forget to sample home-grown treats including Lebkuchen (gingerbread) and the diminutive Nürnberger Bratwurst. 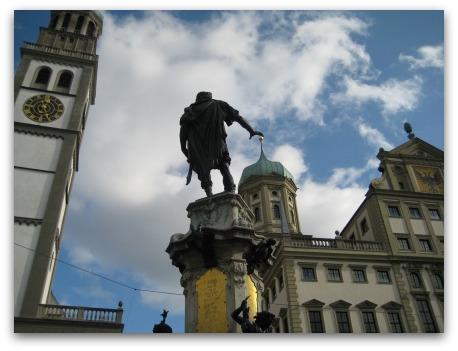 FOUNDING FATHER: A fountain/statue of the Roman Emperor Augustus on Rathausplatz, Augsburg. Augustus' stepsons, Drusus and Tiberius, founded the city in 15BC. Germany’s second-oldest city, Augsburg lies roughly halfway down the Romantic Road touring route. It came to prominence in the Middle-Ages under the lights of Jakob "the Rich" Fugger, once the Bill Gates of global banking and trading. 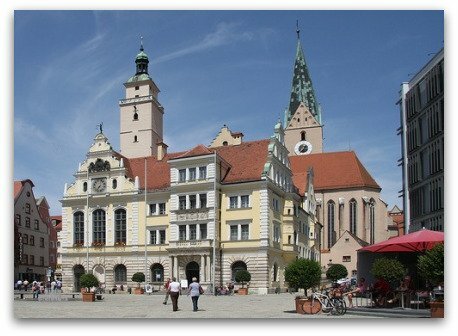 Most of Augsburg’s landmark buildings are the work of architect Ellias Holl (1573-1646). Chief among them is the monumental Rathaus (Town Hall) and its showpiece Goldener Saal (Golden Hall). Another top attraction is the Fuggerei, the world’s oldest social housing settlement. Augsburg is the third-biggest of the cities in Bavaria. IT'S BAROQUE, BUT NEEDS NO FIXING: The Würzburg Residenz. A highlight inside is the Kaisersaal (Imperial Hall) topped with a fresco of Emperor Barbarossa. Würzburg is a bustling university town on Bavaria’s northern periphery. Although over 90 per cent of the city centre was destroyed in World War Two it has since been loving restored. The city straddles the river Main and is the capital of the famous Franconia wine region. 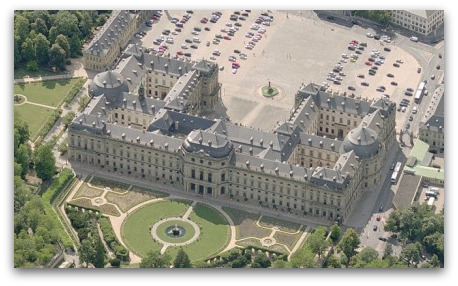 Würzburg’s landmark address is the Residenz, a baroque palace built for a demanding pair of prince-bishops. AN IN-SPIRE-ING SKYLINE: St Peter’s Cathederal dominates the view over Regensburg. Its gothic interior contains dazzling stained-glass windows. 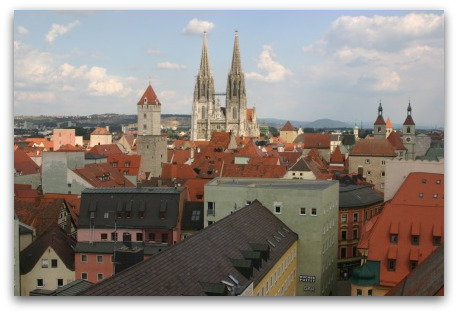 The stuff of Middle-Ages fantasies, lovely Regensburg’s core is a UNESCO World Heritage Site. It sits at the confluence of the Danube and Regen rivers, the former crossed by the humpbacked Steinere Brücke (Stone Bridge). It's one of the most-loved cities in Bavaria and an easy day-trip from Munich. Take a cruise along the river or explore the Old Town. It’s a maze of criss-crossing alleyways centred around the twin-spired Dom St Peter (St Peter’s Cathedral). Don’t forget to take in the grandeur of the palace Schloss Thurn and Taxis. That’s the former home of the founders of Europe’s first postal system. Another age-old Danube city, Ingolstadt is the home of the tragic, the mysterious and the highly auto-licious. Firstly, it was the birthplace of author Mary Shelly’s "Creature", brought to life through the labours of scientist Victor Frankenstein. Secondly, it was the birthplace of the real secret society known as the Illuminati, meaning "Enlightened", which some theorize wields a shadowy hand on the world’s governments and big business. Lastly and much more out in the open, Ingostadt is the headquarters of the Audi luxury car company. Contemplate the past as you stroll its gothic streets. 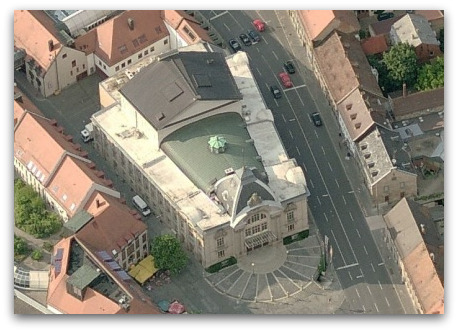 DOWNTOWN DRAMA: The municipal theatre (Stadttheater) in Fürth. in the Italian Renaissance and Baroque styles. Pretty little Fürth is often overlooked by visitors in favour of its noisy neighbour, Nuremburg, given that the two cities’ centres are only 7kms apart. Unfair, perhaps, as Fürth was a totally separate entity for much of its 1000+ year history and boasts a favour all of its own. If you come, don’t miss the grandiose municipal theatre (Stadttheater) and the Jewish Museum – the city once had the biggest Jewish population in southern Germany. 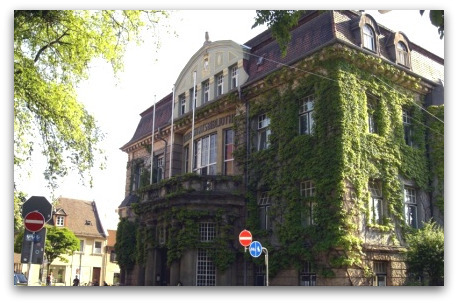 THE IVY LEAGUE: The Old University Library in Erlangen. 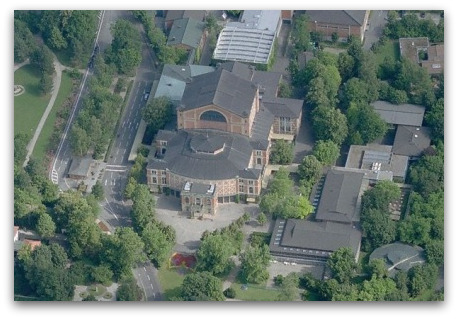 Another centre close to Nuremburg, Erlangen is best known as a university city with broad, tree-lined boulevards. It was expelled from France in 1683. Major sites to see include Erlangen Castle (Schloss) which today houses the university administration, and the botanical gardens. Erlangen’s annual blowout is the Bergkirchweih, a 12-day mini-Oktoberfest that takes place around Pentecost in May or June. Erlangen is one of the more overlooked bigger cities in Bavaria. LONG WAIT: The Bayreuth Festspielhaus. Wagner's great-granddaughters, Eva Wagner-Pasquier and Katharina Wagner, direct the Bayreuth Festival there in their ancestor's name. It can take up to 10 years to secure tickets to the event. Bayreuth is best-known as the home of Richard Wagner (1813-1883), the cranky composer worshipped by King Ludwig II and Hitler alike. The operatic temple to Wagner’s works is the Bayreuth Festspielhaus. It’s the site of an annual showcase of the composer’s operas. Also worth a look here is the expansive New Castle (Neues Schloss) with an enviable collection of porcelain. A top destination for classical music fans. 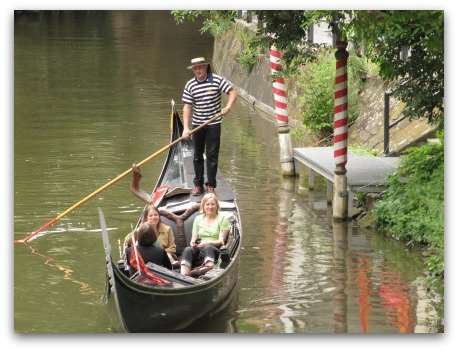 BOATIN' SAFARI: A Bamburg gondalier propels a group of visitors through the city's "Little Venice" district. It's one of the most popular cities in Bavaria. One of the most stunning smaller cities in Bavaria, Bamberg’s UNESCO Heritage-listed streets ooze charm. It’s sometimes known as the "Franconian Rome" thanks to its seven-hilled setting and has its own "Little Venice", a network of canals and streams traversed by tourist-bearing gondolas. A stroll up through the old town, past the town hall island to the magnificent cathedral and Neue Residenz will have even the most jaded travellers in raptures. Few visitors to Bamberg escape without sampling its famous Rauchbier (smoked beer), a reddish ale with the tang of bacon. Much tastier than it sounds. They call this place the "Bavarian Nice" after the town on the French Riviera – think Mediterranean gardens, long, languid alleyways and a sunny climate stimulating subtropical flora. 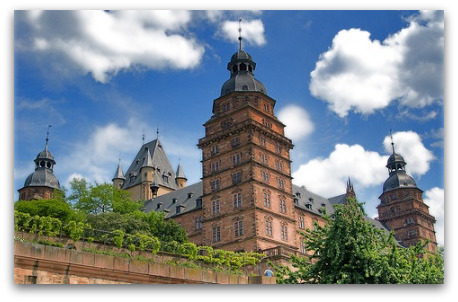 Historically a long way from Munich, and even Franconia, Aschaffenburg is tucked away in the state’s north-western reaches just a short hop from Hessian hub-city Frankfurt am Main. It's one of the most far-flung cities in Bavaria. Things to see here include the high-and-mighty Schloss Johannisburg castle and a replica of a Pompeian palazzo built for King Ludwig I, the Pompejanum. Are you looking for an organized tour of Bavaria? Here's one from my booking partners at Get Your Guide which I can recommend. It takes in a few of the most beautiful small cities in Bavaria. • To see more tours of Bavaria see here at Tours of Bavaria. • Go from Cities in Bavaria to get some more ideas at day-trips from Munich. • Jump from Cities in Bavaria back to Destination Munich Home.